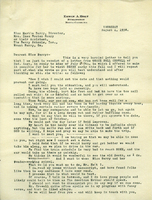 Mr. Holt includes part of a letter from Grace Noll Crowell about a possible visit to Berry. Ms. Crowell writes that she wishes she could come, but that two of her sons have been sick recently. She says that she will try to visit as soon as they improve. She talks about sharing her poetry with the students. 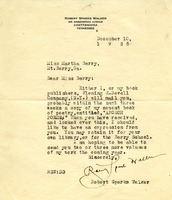 Mr. Holt suggests that Martha Berry write to Ms. Crowell about the visit. 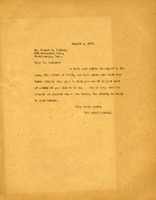 Letter includes a poem by A. L. Frink, "The Rose Still Grows Beyond the Wall." 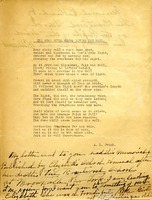 A note at the bottom informs Miss Berry that the poem was published as part of a memorial for Elizabeth Widdicomb, a thirteen-year-old girl at the Brentwood School who passed away earlier that year. The author hopes that the poem will allow Miss Berry to know something of Elizabeth. 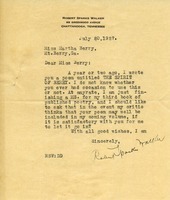 Walker seeks approval of including his poem about Berry in the next volume of his work.